Eleanor is lucky to have three sets of grandparents, but all of them live very far away from us. One of the new things I'm trying to do to keep us connected is to send letters and artwork in the mail. She comes home with a lot of artwork from school, which is awesome, but also has me wondering what the heck to do with it all. There's a small stack that is going into cards we'll send, and we're going to use the huge pieces of painted paper that come home from time to time to wrap some Christmas gifts. When Ellie's official school photos came home a couple of weeks ago, not only was I wondering if it might be the best school photo of all time (because seriously! it is in the photo at the bottom of this post), but I also thought we should do something special to send copies to her grandparents. Over the summer, I had a great conversation with someone over at Treat, which is one of Shutterfly's sites that focuses just on cards. It was fun to learn about the site, and as soon as I saw Ellie's photos, I finally had the perfect idea to try them out. I sat with Ellie and we made a list of her favorite things about school so far. All the words are hers, though the editor in me couldn't stop myself from making the list "parallel" in structure. That urge just never leaves me. We then sat down at my computer and chose a photo from the handful of first day of school photos I'd taken. She insisted it was her favorite favorite favorite, and we put it on the front of the card. We had the option of adding another photo inside, and I remembered that we had a great one from her teachers. In September they focused on "construction" and had their first field trip to the facilities department on campus. Ellie talked about it for days. So I asked her to tell me about this photo and her favorite parts of learning about construction. I literally typed what she dictated to me, and I love how she started by saying, "This photo is full of joy!" I typed up her list and then we were able to put a tiny photo of her on the back plus a short note. She wanted to type so I spelled "Made with love by Eleanor Jane," and she was so excited to be able to type like Mama on the laptop. The whole process was very easy and we were on the Treat website for about 15 minutes from beginning to end. About one week later the cards arrived. 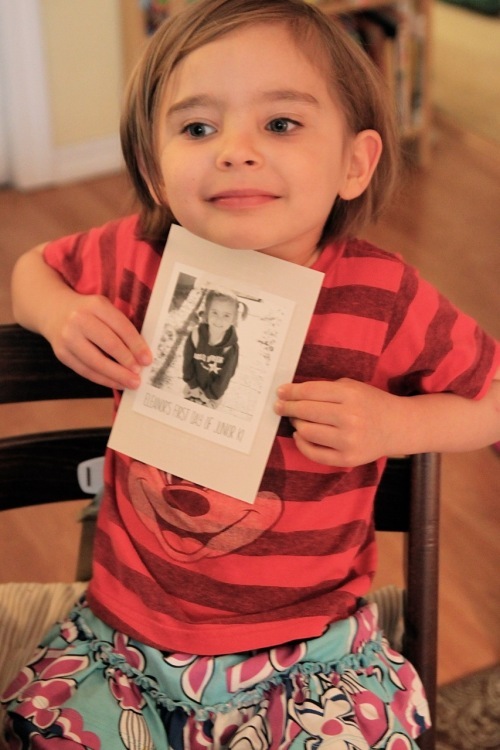 You can have Treat mail the cards for you, but we wanted to include her school photo + I wanted her to sign her name because she's writing her name everywhere these days. The ease of using Treat + how fast they come + the joy on Ellie's face when she saw the cards in person and was able to sign her name and put them in the envelopes pretty much means the grandparents will be getting these every couple of months. I can slide in other photos I've printed out at home, and they can feel a lot more connected to all of us. Disclosure: Treat did not sponsor this post or provide me with free cards. However, affiliate links are used throughout, which means I receive a small commission if you order from Shutterfly or their companies through these links.